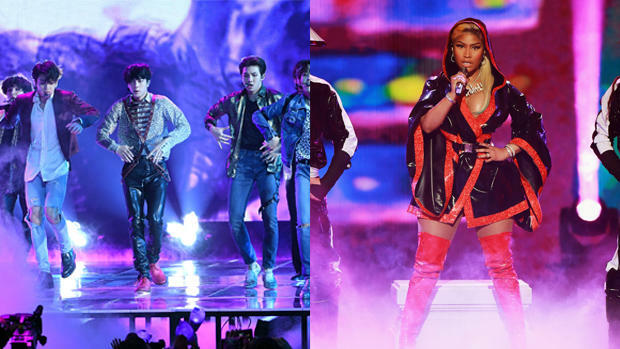 Nicki Minaj teams up with K-pop band BTS for "Idol"
Nicki Minaj has joined forces with K-pop boy band BTS for a new version of their track "Idol." BTS dropped their latest album, "Love Yourself: Answer" on Friday, as part of their "Love Yourself" trilogy. The new album has 25 tracks and is the final installment of the trilogy, after "Love Yourself: Her" and "Love Yourself: Tear." On Wednesday, BTS teased their song "Idol" with a 40-second video, but on Friday, in addition to dropping the new album, BTS and Nicki Minaj also revealed their collaborative version of "Idol" as a digital track. The Seoul Economic Daily reports that BTS invited Minaj to rap on the track. Minaj tweeted on Friday morning, "Uh!!! What's Good KOREA?!" along with a screenshot of the track playing. The teaser video for the original version of "Idol" showed references to traditional Korean culture with Korean-influenced architecture and clothing. BTS' last album, "Love Yourself: Tear," was the first-ever album by a Korean artist to snag No. 1 on the Billboard 200. Last year, they made their American TV debut at the American Music Awards, and became the first ever Korean boy band to perform at the show. The band kicks off their "Love Yourself" tour on Saturday in Seoul; then they will head to North America with concert stops in Los Angeles, Oakland, Fort Worth, Hamilton, Newark, Chicago and New York City before finishing their world tour in Europe and Asia. Former One Direction member Liam Payne is also a fan. He tweeted his support of the band's new album on Friday. You can listen to "Idol" feat. Nicki Minaj below.